Mary and I headed to Manhattan, I found out Mary listens to Fleetwood Mac (well done, young lady! ), and Mary admired the lovely purple bus. I started up the engine (runs very smoothly! ), ran through a pre-flight checklist (right rear turn signal doesn’t light; all others are okay), and then put it into gear and eased out the clutch. Already bad. But I’ve seen manual-transmission vehicles that had a single gear — often a low gear — broken, so I tried it in 2nd. Still nothing. Tried several combinations of high and low on the split shifter with 1st and 2nd gears and couldn’t get it to do anything. Went inside to ask how it had got to the auction site, and the front counter folks didn’t know but the folks in the back ALL KNEW THAT IT HAD BEEN TOWED IN AND COULDN’T BE DRIVEN. In fact, the previous owner had been driving it to the auction site when it broke. I think that would be something I would mention pretty loud and clear if I were selling a vehicle. While they looked for a manager, I went back out, fumed, and pondered. My brother’s neighbor is a fleet and heavy equipment mechanic for the state, and I figured “Neighbor Dan” could easily fix the problem in his shop; but two hours from home in a parking lot, with probably not a lot of local options to buy parts for something that big? The manager who came out was very helpful and indicated that just to get things started, he’d give me more time to explore my options without charging the “storage fee” for not having removed the bus from their lot yet. He almost offered to refund my purchase price — but if the problem has an easy fix, I do still want the bus, and I have no illusions that it’s in perfect condition and will never need maintenance. I just thought it was drivable, since I explicitly asked that before the auction and was told yes. I rejoined Mary in the SUV, explained the situation, and agreed to get lunch in town before heading home. Over lunch, I ran through the list of things I had tried with the transmission and wanted to tell Dan about. While doing so, I realized that just to be thorough, I should go back and see whether the driveshaft was spinning while the transmission was in gear. 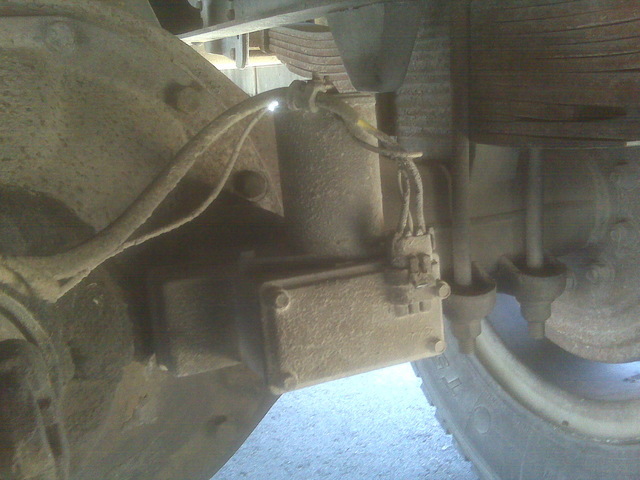 We went back to the bus, put it in gear, and indeed the driveshaft was spinning. I don’t know much about split shifters and I’ve never (knowingly) driven one before, but the idea is this: In addition to the transmission at the front of the driveshaft having different gears that vary the rotational speed between the engine and the driveshaft, there’s also a two-gear (in this case) selector inside the differential at the back of the driveshaft that varies the rotational speed between the driveshaft and the axle. So where along the way was the problem with the split shifter — at the front of the bus by the switch or relay, in the line from the front to the back, or at the shifter in back? The split-shift switch on the stick shift had to be connected to the split shifter mechanically, electrically, or hydraulically, and just my luck — it’s electric. I rolled under the bus and got into position, where I could actually sit fully upright. With the engine off but the ignition key in the run position, I had Mary toggle the split-shift switch back and forth. We could hear a relay click under the dash, but no whirring or clunking at the split shifter. Neither of us had a voltmeter along (oh, the unbearable shame! 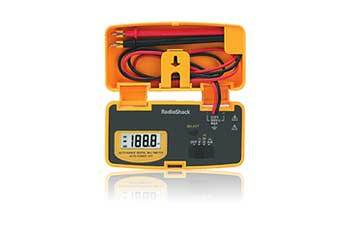 ), so we ran to Radio Shack and I bought what seemed like a nice pocket meter (in grey, not yellow). In retrospect, the battery compartment lid bulges almost enough to pop loose, it’s very hard to get the probe cables tucked away so the case closes properly, the lid is very hard to close properly anyway, and the way the lid folds back when open makes the whole tester very floppy and precarious. Oh, and the auto-ranging function — although it seems like a good idea — is incredibly slow, so it takes several seconds to take even the most basic reading. As Mary moved the switch back and forth, I could see (after waiting the requisite several seconds) 12V appear on the wiring harness connector at the green or yellow wire — so the signal was at least getting to the back of the bus. I pulled the cover off the electrical panel, noted the differently-colored wires inside than out, and poked around the circuit board. I should have got a picture of the other side, but the short wires made it awkward. There are two (large) microswitches that align with two bumps coming out of the mechanical housing. It looks as though the switches are NC and act as endstops. The 12V from the front powers the shifter gearmotor or solenoid until it fully engages the desired gear, at which point the “bump” pushes out to engage that direction’s microswitch and remove power from the shifter. Then the whole thing sits idly by until told to shift the other direction. 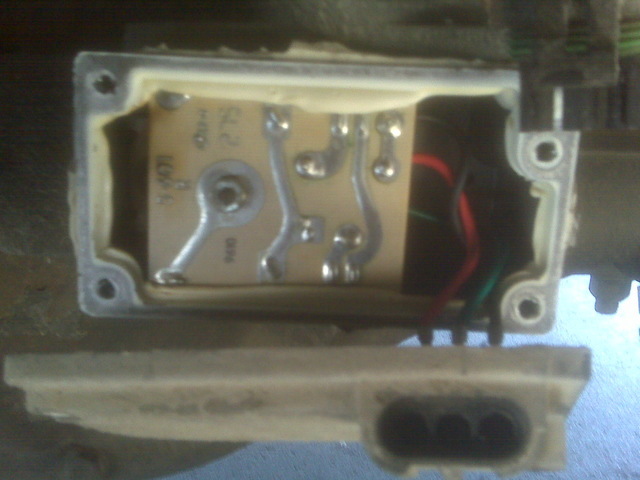 With the lid open, I was able to see the 12V on the appropriate traces on the circuit board — but still no action from the shifter. With this newfound information, I closed up and we went back home. “Neighbor Dan” thinks (as I do) that the problem is with the shifter, not the differential; that he has enough information to order a correct replacement part by the weekend; and that he can go up Sunday, fix the shifter in the parking lot, and let me drive the bus home. This entry was posted on Tuesday, June 2nd, 2009 at 3:55 pm	and is filed under Acquisition, Expense, Mechanical. You can follow any responses to this entry through the RSS 2.0 feed. You can leave a response, or trackback from your own site. Well, you certainly seem better equipped to handle this than some people would be. I look forward to seeing how the conversion goes. John — what’s your theory? “Linkage” might be the driver’s code for “I dunno. The bus doesn’t move anymore. Maybe some guy named Keith will figure out it is the shift splitter.” But then I don’t know when the condition report was filled out and who filled it out. This is off the subject of the shifter, but might be info you can use in the future. At one time, I installed window tint in vehicles. The “purple” tint on the windows is actually just faded tint. There are several levels of quality of tint on the market. The cheap brands (found in most auto parts stores, wal-mart, etc…) will fade from smoke/gray to the light purple within a year. 3M is known for making very high quality tint film that doesn’t fade, is scratch resistant, has UV protection and comes in a multitude of tint levels. Removal of old tint is not too hard. The film should just peel off. It will leave a gummy residue behind, but windex and razor blade scraper will remove it. I don’t envy that process with all those windows. Nice call. I speak as one who hates car electrics. To spot an electro-mechanical fault on unfamiliar equipment is out of my league. I once spent a weekend up-side-down under a Triumph Spitfire dashboard getting the heater to work. A critical issue on a leaky sports car, if you can’t see out the front you might not see the accident about to happen. Chewie, to be fair, a lot of the difficulty I have under a dashboard is just finding tracing wires. With the split shifter, it was obvious which wires were the right ones. Mike, great to hear from you again! It’s good to know about the cheap tint — I’ll keep that in mind. Although I’m not impressed with the purple, I’m not specifically in a hurry to replace the window tint — for one, I’ll want to determine which windows will be painted opaque before bothering to retint the others. And I may just get it professionally done and save the hassle. I hadn’t thought about window tint laws with respect to passenger windows in a bus/RV — worth checking out. I wonder where I’d go to get the official skinny on that.